Few islands in the Galapagos lack obvious evidence of volcanic origin. Rabida Island is no exception. 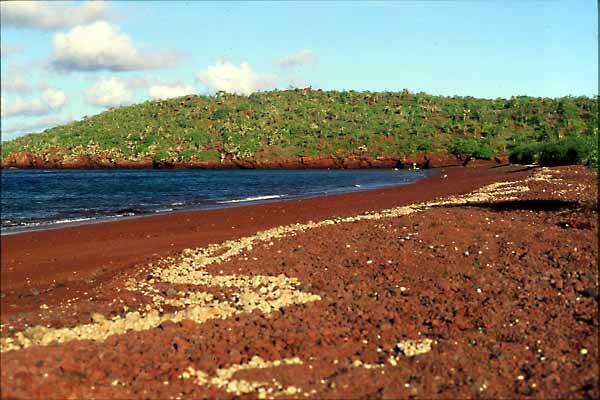 On this beach a reddish volcanic pumice (called scoria) forms cliffs and beaches along the shore of Rabida. Washed up flotsam leaves a pale line along the sand and pebbles, behind which grows an extensive stand of salt bush (far right). Beyond that much of the island is covered with mixed prickly pear and palo santo forest. The beach is favored by sea lions. Over 100 breeding females have been observed here.